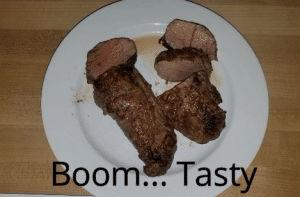 Pork tenderloin is a boneless piece of meat cut from a muscle that runs along the central spine above the ribs and belly. Unlike a leg or shoulder muscle, it’s not directly used for walking around. And that’s why the meat is so tender. Hence the name. This is a versatile cut of meat is best for quick roasting, broiling, grilling, sautéing, and braising. Keyword here is quick. This is imperative when cooking for a group of hungry firefighters (of kids). By itself, it's a mild-tasting meat. So think of tenderloin is lean and a blank canvas. You can marinade it with almost anything. Fruit juices and spices are great options, the fruit helps to start the cooking process and seal in flavor. Choose your meat. I like (for time saving reasons) to choose a tenderloin that is already marinated. This makes it easier and quicker to get on the table. First thing is add oil to a pan. After the pan heats, add the tenderloin to sear for 2-3 mins a side. I do 3 sides which means I turn it 3 different times (2-3 minutes each side). Next, remove from pan and bake in non-stick pan for 15-18 minutes at 400 degrees (until the pork is 145 degrees, use a meat thermometer to be sure). Once the meat hits 145 degrees (usually 15-18 minutes) then remove from oven and cover with foil for 10 minutes. This is a very important step. There are two reasons why you want to let your tenderloin rest. When you take your roast out of the oven, the moisture still inside needs some time to redistribute back through the meat. If you cut into it right away, the liquid will actually pool out and taste dry. By letting it rest, the moisture is reabsorbed and your meat will be tender and juicy. The second reason why you want to let it rest is that the meat will actually continue to cook for a few minutes after you take it out of the oven. This is called carry-over cooking and is why many recipes tell you to take meat out of the oven a little before the meat is done cooking. Serve with some mixed vegetables and quinoa for a complete and healthy meal. ENJOY! 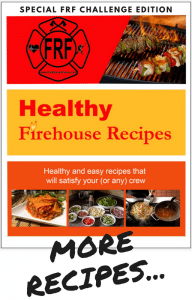 Looking for more great recipes for your crew and family? 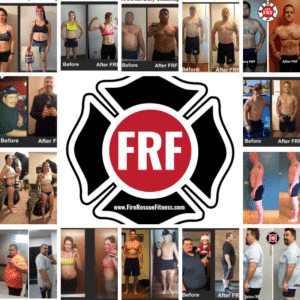 Every FRF (Fire Rescue Fitness) workout. Click here to discover the great FRF Workouts and these easy and healthy recipes.